Legoland move over! Lego, a multi-million dollar toy industry, bases its building block toys on creating representations of a western society at work and at play. Ole Kirk Christiansen (1891–1958), a carpenter from Billund, Denmark and founder of Lego, began making wooden toys in 1932. At about the same time in Nigeria, Mr. J. D. Akeredolu, a craft teacher in Government School, Owo, Ondo Province, experimented with materials to carve name stamps. He discovered the conical thorns that grew at the base of some forest trees were suitable for carving detailed, miniature sculptures. These delightful figures featured everyday life in Yorubaland. The imagination of these two men mirrored the customs and culture of the life around them represented through their craft. Whether in Denmark or Nigeria, Christiansen and Akeredolu carved their world. We are the recipients of this grand reproduction of cultural anthropological art. In the 1930’s, Mr. J. D. Akeredolu taught the art of thorn carving to his pupils and generations later thorn carvers still produce charming, miniature sculptures of a traditional life style. Mr. Akeredolu’s philosophy was similar to that of the Lego philosophy: to build something amazing from the tools at hand. Thorn carvings are unique to Nigeria. 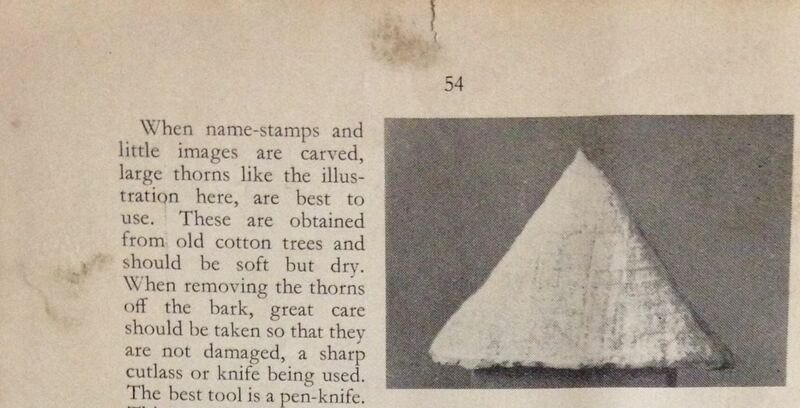 The thorns come from cotton trees come from a cotton tree. The thorns grow up to 5 inches in length and their relative malleability makes for easier carving with a simple pocket knife. The thorns come in three different colors: beige, pink and brown. The brown color comes from the thorn of the Ata tree while the pink and softer wood of the Ogungun tree is used to carve small pieces like hats, dishes, legs and arms, which are glued into place with a paste made from rice water. The Nigerian Teacher, Published for Education Dept. of Nigeria, by West African Publicity LTD, London & Lagos Vol.I, #4, 1935. Article by Mr. J.D. Akeredolu. See full article here. From the typical Yoruba village life of pounded yam and palm wine tapper to a commentary on social issues of 1970s Bar Beach executions of criminals to satirical visa queue, thorn figures have the absorbing quality to relate traditional Nigerian lifestyle on a diminutive scale. The carvings are specific to the Yoruba culture and mirror life events such as women preparing food, fishing and hunting, transportation, even a nativity scene or a mosque. After ‘mammy wagons’ were banned, the carvers turned to crafting the more common mode of transportation: the motorcycle and the ke-ke (tuk-tuk; auto rickshaw). There are carvings of a kidnapped oil executive being taken away by heavily armed men in a canoe with the military in pursuit telling the story of on-going kidnappings in the Delta area of Nigeria. Thorn figure carvings may not develop into an industry or a theme park. Yet they still capture the imagination of young and old alike. Whether coming upon them in a local market or perchance finding a trader on the beach, it is always a delightful pastime to study and appreciate the intricate carvings that provide us with an excellent illustration of Yoruba culture and customs. This entry was posted in Nigeria and tagged J.D. Akeredolu, Lego, Ole Kirk Christiansen, Thorn carving, Yorubaland by kobrigama. Bookmark the permalink. Lesley, thank you for this wonderful article. I was delighted that you are featuring the magical art and craft of the thorn figure carvings. I have marveled at these miniature life scenes and I so appreciate seeing pictures of the carvers and learning more about their life and culture. Oh I am so glad you find this story interesting and relevant. The miniatures are so delightful and give insight to a traditional Yoruba village lifestyle. Thank you for your comment. L.
I love reading your articles – they really bring back the magic of Africa. I still have some of the thorn carvings I brought back from Nigeria – not all have survived, but I treasure the ones that did. Please keep writing and keeping the memories alive. Thank you. ps I just found out that AIS is having their 50th anniversary. I will be in Lagos. I may check it out.